Summer is coming soon, and that means that Apple fans around the world will be heading out on vacation. If your travel plans include traveling to a place that doesn’t use the same type of power plug that your home country does, you might find yourself searching around for a plug adapter so your MacBook, iPhone or iPad can get powered up. Today we’re looking at the OneAdaptr Twist+ World Charging Station ($44.99) and Twist+ World Adapter Duo (coming soon, no price listed) universal power adapters that are designed not only to easily get your MacBook the juice it needs but to charge up four (Twist+ World Adapter Duo) or five (Twist+ World Charging Station) more devices at the same time. The Twist+ World Adapter Duo and Twist+ World Charging Station look about the same, featuring a cylindrical section that plugs into whatever wall socket you happen to find. On the back of the devices are an ingenious set of plugs that pop out to let you plug in anywhere. The bottom of the device is designed to plug onto your MacBook power adapter (after removing the “duck head” that contains the plugs), while the front of the cylinder has two (Twist+ World Adapter Duo) or four (Twist+ World Charging Station) USB ports. The front of the Twist+ World Adapter Duo features a universal outlet — kind of the “female” equivalent to the universal plug on the other end. 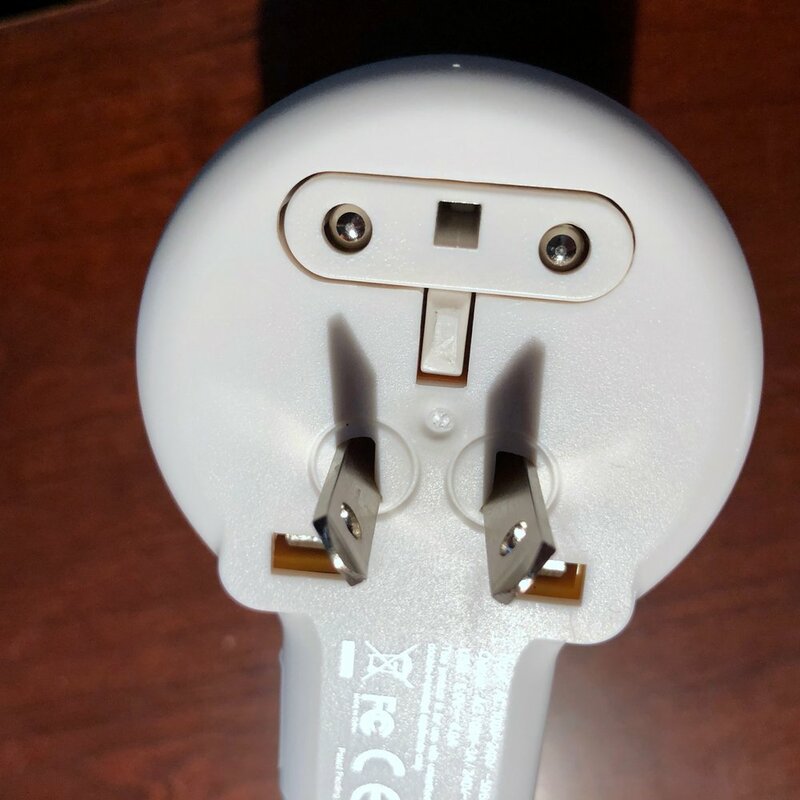 To switch between the US, EU, UK or AU type plugs, there’s a rotating section in the middle of the adapter. It locks into place with the plugs hidden for transport in one position, moves the UK plugs into place with a twist in one direction, pushes out the EU plugs with a rotation in the opposite direction, and finally can show the US and AU plugs when rotated all the way in the opposite direction. 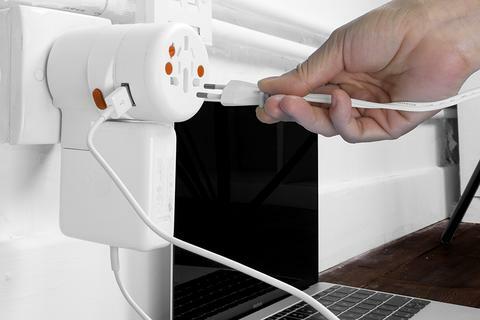 The US plugs can be rotated by hand to an angle to fit AU sockets. The Twist+ World Adapter Duo weighs in at 6.26 ounces (177.5 g) while the World Charging Station is slightly heavier at 6.34 ounces (180 g). Neither of the plugs will take up too much space in your luggage: the World Charging Station measures 2.28 x 2.28 x 3.41 inches (58 x 58 x 86.5 mm) and the World Adapter Duo is 3.31 x 2.28 x 3.41 inches in size (84 x 58 x 86.5 mm). Although I haven’t had the opportunity to try these in action on foreign outlets, I did try using this on the US sockets in my home and it worked great. Other adapters I’ve used in the past didn’t have the locking capability and the plugs would often “collapse” as I tried to push them into the socket. The photos in the gallery below show how the plugs pop out of the rear of the World Charging Station based on the rotation of the center section of the adapter, as well as how the MacBook adapter can be plugged in. The OneAdaptr Twist+ World Charging Station as it would appear when packed for travel. In case you’re not sure what kind of plug is used in the country or countries you’re visiting, a handy pocket-sized card lists most countries and the outlet style they use. The Twist+ World Charging Station can supply up to 4 A to USB devices. The Twist+ World Adapter Duo supplies a maximum of 3.4 A. There’s a plastic cover that protects the spot for plugging in your MacBook power adapter; note that any Apple power adapter that has a way of switching out the prongs can be plugged into the area for the MacBook power adapter. As you’d expect from devices that are used to transfer power, both the Twist+ devices feature the CE and FCC markings. Compared to other universal adapters I’ve used in the past, both the Twist+ World Adapter Duo and World Charging Station are top-quality at a very reasonable price. The ability to use these to charge both MacBooks and other Apple devices simultaneously is a definite benefit, and the design is clever enough to have come out of Cupertino. We have a OneAdaptr Twist+ World Adapter Duo to give away to one lucky reader. Just fill out the form below between now and May 28, 2018, and you'll be entered in our giveaway -- no purchase is necessary. Your name will be placed on our mailing list for deals and newsletters; if you wish, you can unsubscribe at any time. Thank you for entering our giveaway. Your name and email address will be added to our newsletter mailing list. Note that you may unsubscribe at any time…but we’d love for you to take advantage of our many deals in the Apple World Today Deals Shop. The winner of this giveaway will be contacted via email for shipping information the week of May 28, 2018.